After taking an exam, the exam participants will receive an email with their score. Those who pass the exam will be directed to update their personal MEF Carrier Ethernet Professional Profile. This profile holds the exam participant's digital and printed copy of their personalized certificate and logos. 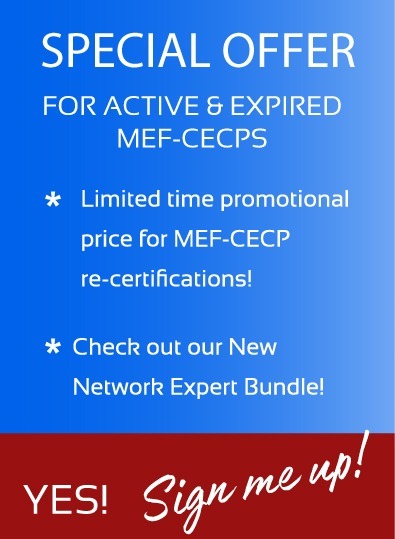 The awarded participant is then listed on the MEF Carrier Ethernet Certified Professional page. Your first exam attempt is $420 USD. If you don't pass after the first attempt, two re-take exams are only $100 USD each. Should you fail the exam a third time, the fourth must be registered as a new exam and charged at the normal examination fee established by the MEF as of that time. Re-certification should be achieved within the 3 year expiration period. Re-certification is $300.00 $175.00 (click here for the promotion details) and re-takes are $100 each. Each exam participant is limited to no more than 3 total exam attempts consecutively in a 6 month period.